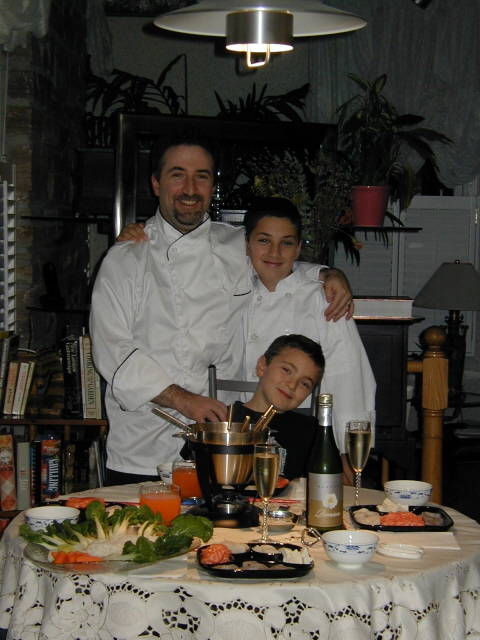 At Sous Chef Joseph’s inspiration, a couple of years ago, we started having theme dinners. These are an amazing way to involve kids in meal planning. Of course, one of our fallback positions is always pizza night, but it must be with freshly made pizza dough and sauce. Never, ever, anything canned, frozen, or ordered in. We’ll be sharing some of the menus and experiences here. A cool idea I came up with, ok, borrowed, from reality TV is the challenge. This made the menus even more fun and involved the kids for most of the day. Talk about bonding! Of course, when you’re a kid, small or large, winning can be everything. The challenge of the challenge is to avoid bloodshed in the kitchen, which can be a dangerous place. My guys are pretty competitive, and have already hinted at cook-offs. What have we started? We had an awesome time today at the St. Lawrence market. I learned to shuck oysters behind the counter at one of the fishmongers today. What a time. I just wish we had remembered to bring a camera. We drew a crowd of onlookers wanting to know what the commotion was all about. Dinner tonight is going to be wild: Malpeque Bay Oysters on ice; Giant King Crab legs (recipe); hit with a hammer; huge lobster tails, with shells sliced.Andrew: We had two bad oysters out of twelve. Yuck.To do justice to the oysters, I had to come up with a seafood cocktail sauce from scratch – no capsicum, of course, but definitely fresh horseradish, and, of course wasabi (how can I not?). It worked out pretty well, if a little thick. When I get it to the right consistency, I’ll post the recipe. So, Joseph’s suggestion for the last pre-renovation dinner theme is…Breakable Food!What the heck is breakable food? Maybe he has a new career as the host of Iron Chef Canada. It quickly evolved into, food you can hit with a hammer. So, we’re doing cracked lobster, cracked king crab legs, and I’m going to give oysters a shot, depending on how ambitious I feel on Saturday, and whether I can find an oyster glove. If people can cut their hands cutting bagels, I’m not sticking a knife into a really upset mollusk without protection. I have a feeling there may be a gingerbread house (or kitchen) involved too that will be ceremonially busted and eaten. We’re keeping things pretty light this week. The Tapas menu was a whopping success and completely exhausting. 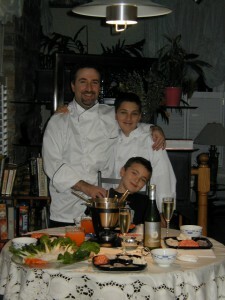 Joseph and I are thinking about doing on last major production in two weeks, just before the kitchen renovation starts. Ideas are welcome. Well, we ended up with the family holiday celebration meal of standing rib roast, and grilled asparagus. For a really nice addition, I took a first cut at a Texan/Brazilian version of Gougères, a puff pastry with parmesan cheese – would someone please tell my why that’s Texan/Brazilian? The Tapas menu is scheduled for later in the week. Happy New Year everyone from all of us at Heck’s Kitchen.